We departed West Burlington, IA. at 06:00 in "Big Red" with Izona on her trailer. 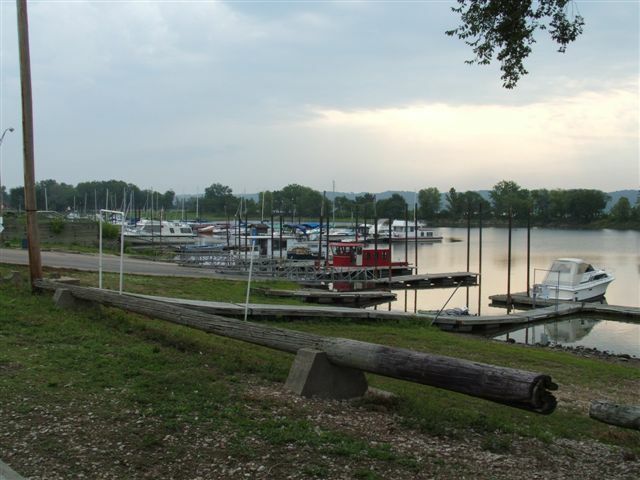 Our destination, Detweiler Marina, Peoria Illinois. It is 100 miles and a 2 hour drive to Peoria from home and well worth the trip. What a great time. When we arrived at the Marina (08:00) Miss Lucky checked out the Harbor Ducks while Lori & I launched Izona. Great ramps. After parking the truck we all got on board and motored out into the channel. Illinois River, here we come! There is a lot to see in the Peoria area, and lots of boats to photograph! We headed downbound under the I-74 Hwy. bridge and continued our trip all the way to the lock and dam right below the I-474 by-pass. That's where we turned and started upbound. We talked with several of the local harbor towboats, who were all asking questions about Izona. We also took lots of pictures. OH, by the way, we saw a sign that said "Hooters" delivers to the lock and dam. Lori took my mobile phone and turned it off? Traveling on North we spotted Hamm's Holiday Harbor Marina. What an interesting place to take pictures! Lots of old towboats, a couple of stern wheelers, and lots of houseboats. Departing the marina and again heading north we were all startled by a loud crash! I was at the helm, and thought I hit a log? Wrong! After it happened again, Lori looked towards the back of the boat, let out a scream and said "look at the size of that fish"! One had landed on the engine cover. We later found out the Illinois River is infested with Asian Carp. Also called Big Head or Silver Carp. They jump out of the water when a boat passes by, sometimes hitting the boat! Glad we have a cabin. We continued on north, trying to avoid the "killer carp" and pulled into the marina at Lacon Illinois. Time to take Miss Lucky ashore. After boarding and departing the marina we decided to start back. We had come a long way, but what a ride! We settled in for a nice trip south. It was 18:30 when we arrived at our launching point. Where did the day go? Izona of course loaded easily on her trailer. Miss Lucky again had to check out the harbor ducks, and we started our trip home in "Big Red." We had put 10.2 hours on the hour meter in Izona, but it felt like an hour tops! Well, that's our little story for now, but it's not over! Ever! Tim Lori & Miss Lucky!